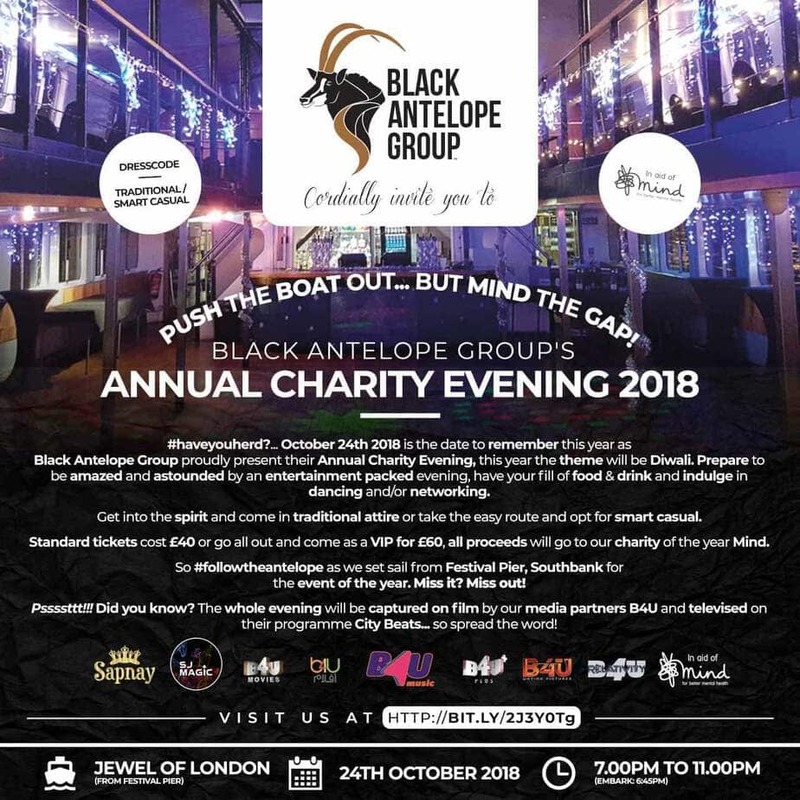 #Haveyouherd?… the 24th October is the 2018 date to remember as The Black Antelope Group proudly present their Annual Charity Evening, which this year will follow a Diwali theme. Prepare to be amazed and astounded by an entertainment packed evening, have your fill of food and drink, try your luck with our charity auction and indulge in dancing and/or networking as we cruise the River Thames. An England rugby shirt signed by Andy Goode. Five personal training sessions at your home. A free photoshoot with Pure Desi Experiences. A cream tea cruise for two. A free introductory yoga class for two at ChromaYoga. White water rafting on the London 2012 Olympic rafting course with a GB Gold Medallist. A cricket masterclass with Mark Ramprakash at Lords Cricket Ground. A training session with Saracens at the Allianz Stadium followed by a meal and Q&A. Get into the spirit and come in traditional attire or take the easy route and opt for smart casual. Standard tickets cost £40 and include an Indian street food buffet or go all out and come as a VIP for £60 and enjoy an exclusive bar, stunning top deck views and front row seats to the entertainment as well as a special surprise. All proceeds will go to our 2018 Charity of the Year, Mind. Pssssttt!!! Did you know? The whole evening will be captured on film by our media partners B4U and televised on their programme City Beats… so spread the word! You can purchase tickets to the event by clicking the button. Please note you must accept our functional cookies on our cookie control tool to successfully complete your purchase. You can find out more about how your donations will support Mind’s work here. So #followtheantelope as we set sail from Festival Pier, Southbank for the event of the year. Miss it? Miss out!